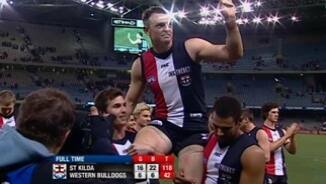 The final siren sounds with St Kilda far too good for the Western Bulldogs. They will need some kicking practice during the week but still manage to win by 76 points. GOAL SAINTSKochitzke marks and handballs it to Milne alongside him. Milne kicks it low over the fence. Surely not a co-incidence that it's the Bulldogs Cheer Squad end? The Bulldogs are finishing this match on a high. GOAL BULLDOGSGiansiracusa marks it and will line it up from 50 metres out. He won't line it up, he turns and handballs to Gilbee who runs in and kicks the goal. The Bulldogs have lost their last six matches now and could finish the season with ten lossess in a row. BEHIND SAINTSWilkes marks out in front of Riewoldt and Koschitzke, but his shot from 35 metres out is hooked and misses to the left. GOAL BULLDOGSThe Western Bulldogs finally get the ball inside 50 and Dickson takes a very good contested mark. He goes back and kicks the Bulldogs' first goal since the 2nd quarter. The Saints lead by 81 points, but it really should be 120 points given the opportunities they have had. BEHIND SAINTSMontagna is the latest Saint to kick a behind that should have been a goal. BEHIND SAINTSRiewoldt takes yet another mark and runs in from 45 metres, but misses to the left. He has 4.3. GOAL SAINTSHayes drifts forward like he has many times this afternoon. He goes back and runs in from the 50 to kick another goal for the Saints. BEHIND SAINTSSaad runs into the open goal and hits the post. He's not happy with himself, but his team leads by 12 goals. GOAL SAINTSGilbert kicks long to the pocket where Riewoldt marks strongly. He has been unstoppable when in front today. 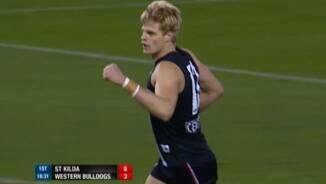 BEHIND BULLDOGSGriffen plays the advantage and kicks from 60 metres out, but it misses to the right. GOAL SAINTSFrom the stoppage, Dunell urges the ball onto Hayes who runs in and kicks the goal. BEHIND SAINTSKoschitzke takes a magnificent contested mark but his shot is poor to say the least from 25 metres out. The Saints have this one all wrapped up at three quarter time with a 10 goal lead. BEHIND SAINTSKoschitzke marks just before the siren. He goes back and shoots, but it just squeezes in for a behind. 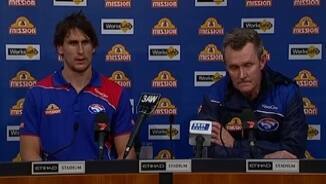 The Bulldogs will be very disappointed with their third quarter. The Saints will be looking for as much percentage gains as they can take with percentage potientially a decisive factor at the end of the season. BEHIND SAINTSRiewoldt pleases the crowd with his run and burst to mark 35 metres out. However, his shot at goal is disappointing. BEHIND SAINTSRiewoldt gets it on to Hayes who misses to the right from 40 metres out. GOAL SAINTSKoschitzke takes a juggling mark only 35 metres out. He goes back and kicks his second goal. The Saints lead by plenty. GOAL SAINTSPearce is tackled only 10 metres out. The ball spills free and Dal Santo is at the right place at the right time to snap it through from point blank range. GOAL SAINTSSteven pounces on the loose ball and spins around then drills it. Saints are beginning to get away. They lead by 45. Dunell comes on as substitute in place of Schneider. BEHIND SAINTSA turnover in defence gifts Riewoldt a golden opportunity, but he rushes it and misses to the left. GOAL SAINTSThe Bulldogs just aren't working hard enough in defence. Hayes is allowed to makr uncontested 40 metres out. He goes back and slots it through. BEHIND SAINTSMilne marks and plays on but his shot misses to the left. BEHIND SAINTSWilkes marks in the pocket 20 metres out, but once again he misses a gettable shot. BEHIND SAINTSLake punches the ball through for a rushed behind. BEHIND BULLDOGSWilliams takes a shot at goal but it bounces to the right. GOAL SAINTSMontagna runs around the boundary line and takes a bounce. He takes a shot and brings the house down. This game needed a lift and that goal is a gem. It's been a slow start to the third quarter in terms of scoring. At halftime the Saints seemingly have this one under control. They lead by 24 points. BEHIND SAINTSSchneider's long shot at goal is off hands and through for a behind. BEHIND SAINTSWilkes marks 20 metres out and misses a gettable one. 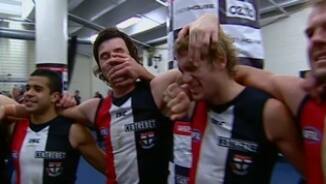 BEHIND SAINTSSaad chips the kick looking for Riewoldt but it clears him and hits the post. GOAL SAINTSSt Kilda move it brilliantly from defence to attack with Schneider marking on the 50. He ignores a free Riewoldt and kicks from outside 50. NEVER IN DOUBT! The Bulldogs have activated their substitute with Patrick Veszpremi coming on for the injured Cross who is wearing the red vest. BEHIND SAINTSArmitage's shot at goal from the boundary is touched on the line. GOAL BULLDOGSGiansiracusa wins a dubious free kick after wrestling for the ball in the goal square. He slots it through as the Saints fans voice their disapproval. GOAL SAINTSThe ball appears t be bouncing out for a throw in before Koschitzke taps it back into play to Dal Santo who kicks long from 54 metres out. It bounces the right way for a beauty! BEHIND SAINTSMilne tries or a miracle on the boundary but it's rushed on the line. BEHIND BULLDOGSDahlhaus with a brilliant tackle is rewarded with the free kick for holding the ball. His shot, however, misses to the right. This game should still be a kick either way given the balance of play with the Bulldogs enjoying more inside 50s. 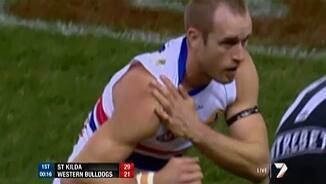 The Bulldogs could be dealt with a blow with Cross running off the field again with his shoulder causing him concern. GOAL SAINTSFrom the bounce Schneider reads it best. He kicks a grubber that bounces the right way for a goal. The siren sounds for quarter time with the Saints holding an 8 point lead after an even first quarter. GOAL SAINTSKoschitzke offers a strong lead and he takes it overhead just inside 50. The shot at goal never looks like missing and Kozzy does some kind of celebratory fist pumping dance 'thing'. BEHIND SAINTSMilne hits the post from the boundary line as he tries the banana kick. BEHIND SAINTSGriffen rushes it through for a behind. GOAL BULLDOGSMinson wins another hitout with the clearance going to forward 50 where the ex-softballer, Jason Tutt, marks. His kick swings back late for a goal. Bulldogs in front. GOAL BULLDOGSGiansiracusa reads it off the ruck. He takes possession spins around like a record on high rotation and snaps it through for a goal. If the Bulldogs were tidier with their disposal of the pill they would be level with the Saints, if not ahead. The quality of disposal is the difference between the two sides early. GOAL BULLDOGSConfusion in the Saints defence with three players not claiming possession. Dickson lays claims to it. Does he ever? He picks it up and snaps it through for a bouncing goal. GOAL SAINTSGeary with an excellent pass to Riewoldt who simply gets to it and marks. He goes back and slots through his third goal. He is set for a big one. BEHIND SAINTSMilne snaps with his left boot, but he misses to the left. GOAL SAINTSMilne takes a couple of bounces before kicking to the lead of Riewoldt. The skipper marks and does not let his mates down. He has two within the first six minutes of the match. GOAL SAINTSFrom the kick it the Saints work it from end to end. 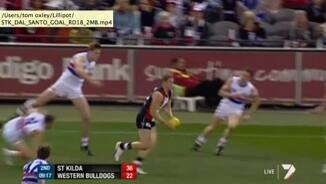 Riewoldt marks it 15 metres out and plays on. He kicks it through and the Saints are on their way. BEHIND BULLDOGSLake's shot from inside 50 is a behind much to the disappointment of the Bulldogs fans. BEHIND BULLDOGSDahlhaus is tackled as he kicks, but it bounces into the post. One late change for St Kilda with Wilkes coming in for Siposs. Dunell and Veszpremi are the substitutes for both sides. Welcome to Etihad Stadium for the clash of cotennants. 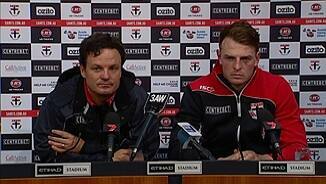 It's St Kilda vs the Western Bulldogs.